Researchers at The University of Western Australia have discovered how ants see in colour, a breakthrough that one day could help scientists create more autonomous robots. In a paper published today in Proceedings of the Royal Society B, researchers Dr Yuri Ogawa and Dr Jan Hemmi from UWA's School of Animal Biology show for the first time that the Australian bull ants (like humans) have three types of photoreceptors that are sensitive to different colours (UV, Blue and Green) and therefore the potential for trichromatic colour vision. Photoreceptors are the cells in the eye that are sensitive to light. This means that their colour vision is likely to be as good as that of humans and old world primates and significantly better than that of other mammals such as dogs, cats or wallabies. Most mammals have only two types of photoreceptors they can use for colour vision, leading to poorer colour perception. However, in contrast to humans, the bull ants can also see UV light, which means they can see different colours than we do. In addition, one of the two species investigated is completely nocturnal, so they only forage at night after dusk. That means they use their three different photoreceptors types at night, during light levels where humans are completely colour blind. Dr Hemmi believes the driving force behind the sophistication of their colour vision is their need to navigate to and from their nest. 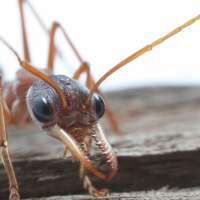 "In contrast to many other ant species, bull ants forage individually, do not lay pheromone trails like other ant species and use only vision to navigate,' he said. "The poor resolution of these ants means they see the world through an eye with only 2-3000 pixels and that must make it very difficult to accurately identify landmarks. Having accurate colour vision could therefore help with landmark identification. It is quite possible that navigation has played a major role in the early evolution of colour vision." The wider context of the research is to find out how animals see their world. With ants, the most interesting question is how miniaturisation affects their sensory systems and the researchers would like to know what strategies ants use to overcome miniaturisation effects such as small eyes and very limited processing power (small brains). The interest in miniaturisation comes from both biology and robotics. Finding how animals navigate and see their world with very limited resources and how they use these resources to best effect could, in the long run, help scientists design more autonomous and effective robots and vehicles. On the one hand, their retinal receptors, like those of birds, have superior bandwidth to a human's eyes, and yet it is assumed that because of their "pixel count" that their overall vision is inferior. On the other hand, we are discovering that it is not pixel count that determines image quality so much as pixel size, and cameras now exist with low pixel count that deliver superior images to cameras with a high pixel count. Ultimately, it is how the visual information delivered by those pixels is processed that determines image quality, and that is something we will probably never know. I have always thought that the apparent "multiple images" of the compound eyes of the fly are in all likelihood processed into a single image, and that our perception of what the fly sees should extend beyond the compound lens into the fly's core processor, another thing we will probably never know any more about.